There are some glorious oceanfront beaches along the shores of St. John, and one of the best is Honeymoon Beach, located between Cruz Bay and Caneel Bay. To access this prime stretch of white sand, you can hike from Cruz Bay or Caneel Bay Resort and pay a parking fee of $20. A gorgeous day on one of the prettiest beaches on St. John is totally worth it, though, and if you spend $20 at the resort, you will be refunded the parking fee when you leave! You can lounge on the sun-soaked sands of Honeymoon Beach St. John or participate in one of the many available watersports. Whatever your reason for visiting, prepare for a relaxing and invigorating day in paradise! If the soft white sands of Honeymoon Beach St. John aren’t enough to entice, the watersports will. Snorkeling at Honeymoon Beach St. John is one of the most popular ocean activities, particularly at a patch reef on the west side of the beach. The waters between Honeymoon and Salomon Beaches are ideal for snorkeling. Most of the reef is located in shallow water, which makes it a great place to see passing fish, turtles, and rays as well as close-up views of colorful live corals. 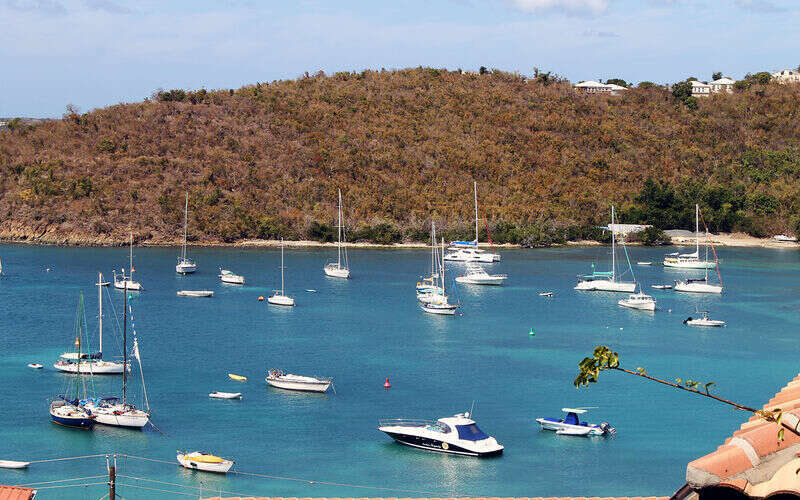 Along with cruising, there are sailing opportunities that await off the shores of Honeymoon Beach St. John. At Sail Caneel Bay, you can choose from a fleet of luxurious yachts and between half-day, sunset, private charter, or wedding cruises! The flagship Spitfire is a John Alden Skye 51 and features wide decks and a large shaded cockpit. She has logged over 60,000 sailing miles, traveling through the Caribbean, Bahamas, Bermuda, and up the US East Coast. For an extra romantic adventure, you can make sure to get a private charter and watch the sunset with your love on some of the most beautiful waters in the world. If you’re not sure exactly what watersport you want to participate in during your stay on Honeymoon Beach St. John, you can choose the all-day watersports package. With this option, you can play, relax, and explore at one fixed price. The pass, which you can purchase from Virgin Islands Ecotours, includes a kayak, stand-up paddleboard, snorkel gear, beach chair, thick ocean pool float, locker for your belongings, and access to restroom facilities. You will also have access to the Honeymoon Hut with hammocks under waving palm trees and ice cream cones, sodas, sunglasses, sunscreen and more for sale. The Snack Shack also sells cold beverages, including alcoholic drinks. If the water isn’t quite your thing, you can try hiking at Honeymoon Beach St. John. The Lind Point Trail to Honeymoon Beach St. John starts behind the National Park Visitor’s Center in Cruz Bay (or for a shorter hike at the top of Caneel Hill just outside Cruz Bay) and travels through tropical forests down to the turquoise waters. The path has fairly easy pathways leading to stone steps that cross a dirt road. A branch will take you to the overlook trail, which traverses both rocky terrain and grassy nooks to an incredible panoramic view of the bay. From there, you will see a sign that directs you to Honeymoon or Saloman Beaches, taking you all the way down to the water! After a day full of relaxation and watersport adventure at Honeymoon Beach St. John, come back to your CimmaronStJohn vacation rental. Get a good night’s sleep before more Virgin Island adventures tomorrow!